Rural Revolution: To boldly cut where no man has cut before! It's the most famous split infinitive in recent history: the eternal words from the original Star Trek series, spoken by William Shatner: "To boldly go where no man has gone before." The more recent and politically-correct version was spoken by Patrick Stewart in Star Trek: The Next Generation: "To boldly go where no one has gone before." My family -- both the one I grew up with and the one I have now -- are Star Trek nerds par excellence. As such, I was hugely amused to come across this Enterprise pizza slicer. 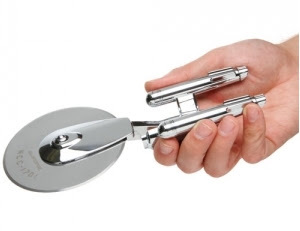 Yes, you read that right: a pizza slicer shaped to look like the original Starship Enterprise. • Boldly cut pizza where no man has cut before! We're definitely going to get one of those for our middle daughter, who is a BIG Star Trek fan. True story: Our daughter, her husband and a few of their friends all went to the theater about 10 years ago to see the current Star Trek movie. They were all in their early twenties. They went to one of those multi-plex theaters where there were 6 different shows all going on at the same time. As our daughter and her hubby and friends walked up to the ticket booth, the young man selling tickets looked at them all and said, "Five for Star Trek?" They had quite a laugh from that! Our daughter told us she asked the guy, "Is it that obvious?" Made us really LOL! You know, I only noticed that change from "no man" to "no one" recently when we went through The Next Generation again. I hadn't realized it had been changed and was surprised when I misquoted it against Picard.